(Update) Apparently, the copyright issue stated below is only a rumor. The real issue to the changes of Facebook Policy are privacy issues. Facebook has created user backlash with its new “WE OWN EVERYTHING YOU POST” policies. I suspect many people will be dropping Facebook. Consider how all business pages’ content will now be owned and distributed by Facebook. 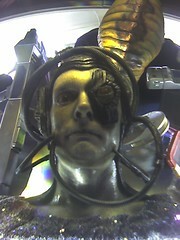 Thank you, Mark Zuckerberg, or should I say, Mark “Sucker” BORG… “You will be assimilated” ? In response to the new Facebook guidelines I hereby declare that my copyright is attached to all of my personal details, posts, commentary, illustrations, comics, paintings, photos and videos, etc. (as a result of the Berner Convention). By the present communiqué, I notify Facebook that it is strictly forbidden to disclose, copy, distribute, disseminate, or take any other action against me on the basis of this profile and/or its contents. The aforementioned prohibited actions also apply to employees, students, agents and/or any staff under Facebook’s direction or control. The content of this profile is private and confidential information. The violation of my privacy is punishable by law (UCC 1 1-308-308 1-103 and the Rome Statute). Anyone reading this can copy this text and paste it on their Facebook Wall. This will place them under protection of copyright laws. Facebook is now an open capital entity. All members are recommended to publish a notice like this, or if you prefer, you may copy and paste this version. If you do not publish a statement at least once, you will be tacitly allowing the use of elements such as your photos as well as the information contained in your profile status updates.